Greece is at a critical crossroad and will be faced with prolonged social crisis unless steps are taken to reverse the situation, says a report by the International Labour Organisation (ILO) for Greece. The ILO study, which was presented yesterday at a special event at Zappeion in Athens, estimates that in 2014 the Greek economy has shrunk by 25% compared to 2008, while since the beginning of the crisis one in four jobs has been lost. This results in the 70% of the total of almost 1.3 million unemployed being without work for more than a year and several, for two years or more. 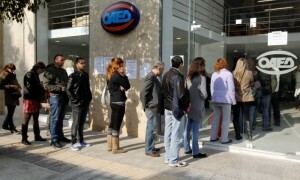 According to ILO, within five years the number of Greeks who are at risk of poverty has more than doubled. In 2013 this figure exceeded 44%, while in 2008 barely exceeded 20%. Accordingly, even at an annual rate of employment growth of 1.3%, the labor market will be able to return to 2008 levels in 2034. ILO asks to halt the policy of wage reductions and to take urgent measures to support jobs and businesses, after an agreement among the government, employers and workers. Greece tops ‘poverty league’ in Europe. Greeks work longer hours than anyone else in Europe. The Office for National Statistics ‘ data published in December 2011 shows that Greek workers put in longer hours than anyone else in Europe — 42.2 per week, compared to just 35.6 in Germany. If you look at full-time figures, it is even starker. The data explodes the crude national stereotypes of prudent hard working Germans and lazy Greeks. See more here. Greek labour costs have been cut drastically and are now half Eurozone average. The health check on the Greek Manufacturing sector is deceptive.